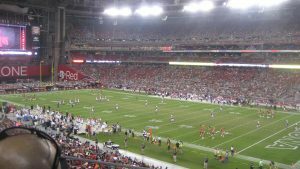 Attending a live football game offers an unbeatable experience, especially if you are a die-hard American Football fan. The excitement of cheering your team, in one way or another, makes you feel as if the outcome of the game is in your hands. One thing to note, how you cheer your team can improve your odds of winning, which explains why teams with a large fan-base find it easy on the field of play. Here are some tips that will see you enjoy football as a spectator. Your position on the stands largely determines how you will enjoy. You need to pick a sitting area where you can comfortably scan the entire field. Somewhere close to the 50-yard line, and 25 rows presents you with an ideal view. Unfortunately, seasoned fans know this and these seats usually belong to season-ticket holders. You can also sit in the end zone and still enjoy the game. So, if you have to sit at the end zone, make sure you get a program or visit the team’s website to view some depth charts and numbered rosters. This will help you identify players on the pitch quickly. Knowing what to focus on is key to enjoying football. Besides just following the ball, you can also try and see what happens when a quarterback releases the ball. You also get an opportunity to assess special moves, especially when you have to follow the entire flight of a ball, which is often 50 -70 yards. The only way you can experience the thrill of a halftime show, especially in the Super Bowl is by attending the match in person. This is when cheerleading squads, spirited bands, and drill teas take over. As much as you are not watching the game, the experience at halftime can be unforgettable.